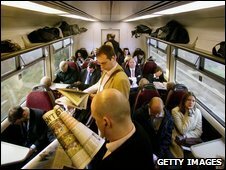 Rail unions have urged the government to stop train companies from cutting jobs to save money in the downturn. The three main rail unions warn the industry is being "vandalised" and want ministers to impose a moratorium on job losses and a freeze on dividends. They say the profits should be used to invest in jobs and services. South West Trains and Southeastern, who run some of the busiest commuter services into London, have announced hundreds of job cuts in recent weeks. The Rail, Maritime and Transport Union (RMT), Transport Salaried Staffs Association (TSSA) and Aslef, representing more than 100,000 workers, have joined forces to call on the government to exercise its financial control over the industry. In a letter to Transport Secretary Geoff Hoon, they said it was "astonishing" rail firms had announced widespread job losses even though companies were heavily dependent on taxpayer subsidies. Bob Crow, general secretary of the RMT, said: "Britain's railways are a core industry that is too valuable to the economy and the environment to allow it to be vandalised for selfish short-term interests. "The government has pledged to fight the recession with investment in public projects and it should not allow itself to be used to subsidise redundancies in a key service whose purse strings it controls." Gerry Doherty, leader of the TSSA, said: "Passengers paid through the nose to ensure record profits for the rail companies during the boom. "Now they want passengers and staff to pay for the bust with worse services and few jobs." Aslef general secretary Keith Norman said plans by Network Rail to reduce spending on track renewals and maintenance threatened to jeopardise the safety of the rail network. "To play with passenger safety in such a way is nothing short of blackmail, but the government has the power to stop these cuts and it should do so." The unions said they had clear indications essential renewal work on the railways was being deferred to make short-term efficiency savings. The unions warned cuts in rail maintenance could lead to another rail accident. A Network Rail spokesman said it would never "compromise on safety" and to suggest otherwise was "scaremongering". "Over the next five years we will be investing around £4bn on an intensive renewals programme to improve the railway," he said. "To get value for money we have looked at all track renewal work for next year and deferred some work, but only where safety and performance would not be compromised."